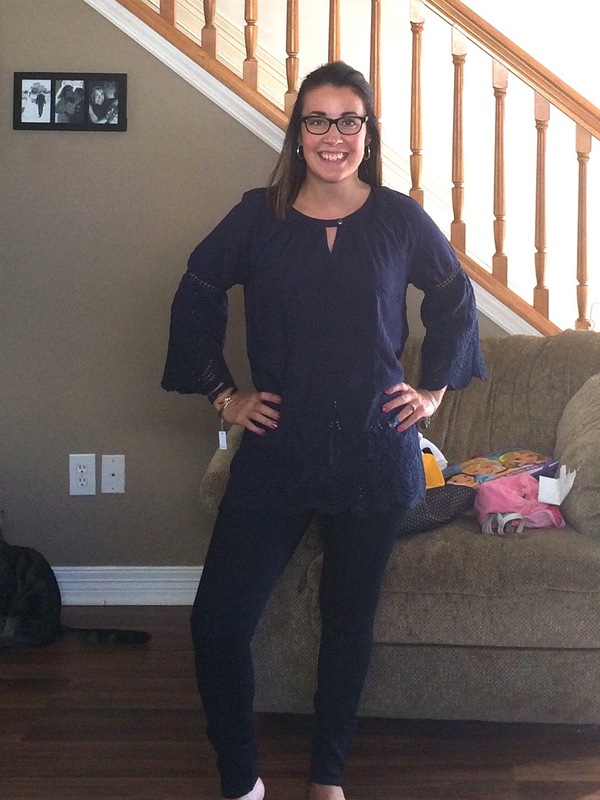 It’s hard to believe that this is my tenth Stitch Fix since Fall of 2015. I have my fixes arrive every other month. Ten boxes in and I still get excited when the mail man drops off my box. One thing I love about Stitch Fix is that I get the opportunity to communicate with my stylist prior to my fix being sent out. I can communicate with her either directly through my Stitch Fix account or through my style board on Pinterest. This time around she sensed my desire for sweaters and scarves as I had spent some time scouring Pinterest for new sweater styles. I must say my stylist nailed it this time! Every piece was adorable. Luckily, some of my family members had purchased Stitch Fix gift cards for me so I could manage to splurge a bit this time around. The color, the fit, and the style of this sweater made it an instant “YES!” for purchase. I love the plum color and the satin under layer in the back. This sweater will go well with several accessories I already own like the blanket scarf in the background. I love this sweater and am sure that it will be a new staple in my winter wardrobe. I’ve been hoping for an over-sized, cowl neck since my last fix. I love the length and color of this top and I know it will pair well with so many things. I like it as is, but can also see myself adding a long sleeve shirt underneath for extra warmth. It is very comfortable and seems well put together. I’ve scored another new favorite for the season. As cute as this top was I decided to return it. It’s a piece I could see myself wearing, but with financial limitations I had to say no. I always have a number in mind before I open a box and I try not to spend over that limit. Having said “yes” to sweaters means that I reached that limit a little sooner than if I had passed on one or both of them. So although I really liked the color and fit of this top I forced myself to pass. This scarf went perfectly with the knit top. The color schemes were similar and the fabrics were perfect compliments. The reason I returned this scarf, however, is because over Christmas I got a brand new blanket scarf in similar colors (navy and orange-Look). As a perk for being a Stitch Fix Influencer I received a blanket scarf from the company. It was an unexpected Christmas present that I have already gotten a lot of wear out of. This layered dress is actually one-piece. It was unique and comfortable, but sacrifices have to be made sometimes. If I already owned a pair of navy leggings I may have been able to justify this purchase, but in order to make it work in a winter wardrobe it would require leggings. Being a part of the Stitch Fix Influencer program has been such a positive experience. I have met so many new people and had the opportunity to answer questions and point people toward a company that I have loved myself. If you are interested in giving Stitch Fix a try please let me know. I will personally help you get set up and started or you can use my affiliate link to set up an account. Stitch Fix offers its customers a personal stylist who sends five pieces per fix to your home. The cost of a box is applied toward any pieces you purchase and there are discounts applicable if you choose to buy all five pieces in your box. I would love to help you get set up and answer any questions. Thanks for stopping by and for letting me introduce you to an awesome company. For the first time ever my Stitch Fix actually snuck up on me and I was completely surprised when I found my box on my porch after school. I had been so caught up in my life, new diet, sick child, and school work to remember that it was about time for my next Stitch Fix to arrive. Around the holiday season I have to tighten the budget a bit so I want you to know upfront that since it had slipped my mind I wasn’t prepared to drop a bunch of money on this Stitch Fix. In the end I only ended up purchasing one piece, but that doesn’t mean I totally hated my items. I was still rather pleased with what I received, but in November I tend to focus more on buying for others than for myself. Here’s a look into my box. The wrap style dress is so beautiful and elegant. I love the fall hues and the fit of this piece. It’s a dress that can so easily go from professional to casual with the right accents. It pairs perfectly with the color of the scarf. I only ended up buying the dress, but if I had more of a budget to work with the scarf would have been my second choice. The color is very hot right now and it could be worn so many ways. I wasn’t a huge fan of the fit of this top. My torso is a bit long so the panel for the shirt hit in an awkward place. The black panel at the bottom was see through and I just felt like the whole top was unflattering to my body shape/figure. I loved the color scheme. Black and white tops are so easy to accessorize and dress up, but I just felt like the fit of this top made it one not worth purchasing. This was another top that didn’t fit quite right. The shirt was too short for my torso, so much so that if I were to lift my hands my stomach would show. It was an instant “no” for me for that very reason. If it was longer, I would have liked the concept. It was cute and warm. I will spare you the image of myself wearing these pants. They did not quite fit. I’m not sure if it is due to the fact that they are skinny jeans, but they were tight in all the wrong places. It was kind of disappointing that only two pieces actually fit in this Stitch Fix, but it’s probably better for my bank account that it worked out that way. I really didn’t have the cash to buy my whole box this go around so I was happy with the outcome. I did not leave a note for my stylist this time around (like I said, it slipped my mind.) It is important to communicate your wishes with your stylist so I blame myself for the fact that I didn’t end up loving more of my pieces. **It is also important to note that if I had wanted to there is now an option to exchange pieces on the Stitch Fix site when you go to check out. If there is a piece you love, but it is in the wrong size you can select to exchange it free of charge. If you are thinking about giving Stitch Fix a try or know someone who is unsure about it, and you want to give them a chance to try it risk-free there are two links below for you. First, if you want to give it a try use this link to sign up. By using my link you give me credit for referring you to Stitch Fix. I am currently a Stitch Fix Influencer which means I may be compensated for this blog post and/or your signing up if you use my link. Secondly, if you know someone who already has Stitch Fix or is thinking about giving it a try you can give the gift of Stitch Fix for Christmas. Use this link to purchase a gift card. Once on the website, click on the Gift Cards tab.I will receive 15% commission if you use this link so I would appreciate if you used it when making a gift card purchase. 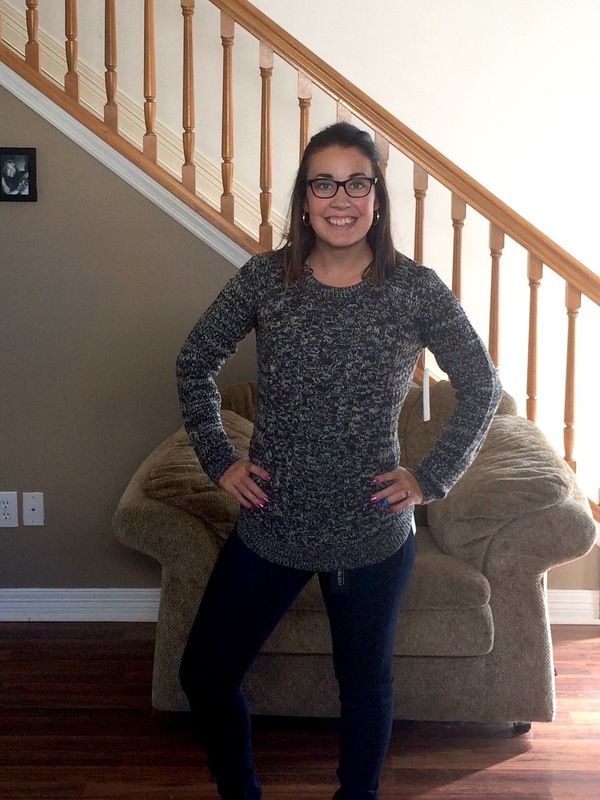 Stitch Fix has been a rewarding experience for me. I almost always love the entire box that I receive and I’ve been featured on some of their social media for my posts and experiences with the company. Let me know if you have any Stitch Fix questions. 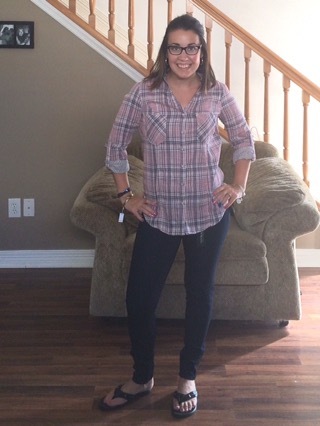 A year ago I embarked on a rewarding journey with Stitch Fix. I heard some friends talking about this online service that sends clothes to your front door with no pressure to purchase. I went home and did some research and by the end of the day I was signed up as a Stitch Fix customer. My experience with Stitch Fix has been nothing but positive. I’ve loved nearly every piece shipped to my home. My stylist and I have begun an open dialogue about pieces I’d like to see in my fixes. To top it all off, I became a Stitch Fix Influencer in August. This is a company that I have loved more with each fix. Every box feels tailored to my style and body type. I’m so excited to share with you my fix #8. This is the first fix where I have purchased EVERY item. I’m always on the lookout for gold jewelery. I love the way this hinge bracelet lays and the fact that it pairs well with my Alex and Ani collection. 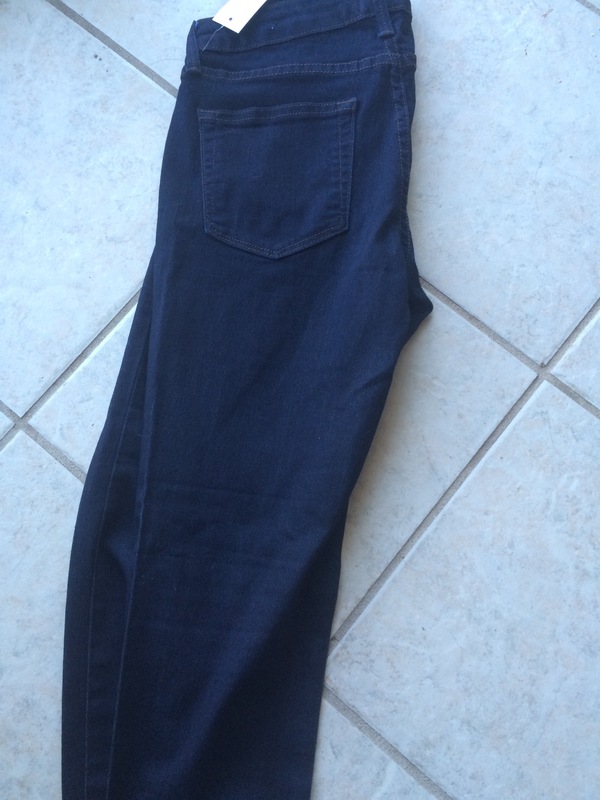 One of the first pairs of skinny jeans to really fit my body well would be these. I’ve always wanted to wear skinny jeans, but because of the proportions of my body they’ve just not fit well. I’ve settled for leggings or jeggings in the past, but this pair of true skinny jeans has me feeling all sorts of good vibes about the size of my hips and thighs. A cute, basic sweater is hard to come by so I knew better than to pass up an opportunity to own this adorable knit sweater. I think the colors make it easy to accessorize. It is fairly versatile as well. I’m so stoked about this piece. Plaid is all the rage this season. You can never have too much plaid in the fall so this quality two-pocket, plaid top will get plenty of wear. I can’t wait to pair this top with my new skinny jeans! I specifically asked my stylist to send me a tunic that I could wear as the seasons transition. This tunic is absolute perfection. With its flowing sleeves and crochet details this top will pair easily with just about any bottoms or accessories one can fathom. I’m looking forward to trying this top out with some patterned leggings, my skinny jeans, and a pair of jeggings. Which pieces did you love? **This post contains affiliate links. I may get compensated as a result of this post. Stitch Fix now carries shoes. And not just ANY shoes. They carry name brand and designer shoes. Spoiler alert: I received some of my favorite shoes in this month’s fix. Before I reveal my pieces let’s discuss Stitch Fix for a moment. Stitch Fix is an online personal stylist program. As the customer you begin by filling out a profile about yourself and your sizes on the Stitch Fix website. From this profile a team of stylists selects five unique pieces and sends them in the mail on a regular basis (the duration of which you can decide). There is a $20 stylist fee for each fix that ships to your home. That fee can be applied to any pieces that you decide to keep from that shipment. After that original $20 fee each time you only pay for what you want to purchase. If you choose to purchase all five pieces in the Stitch Fix box you receive a 25% discount on your order. The Stitch Fix company encourages you to try on every item. Anything that does not fit or that you don’t wish to purchase can be returned in a prepaid priority mail bag that is sent in each Stitch Fix at no cost to you. You have three days from the arrival of your box to complete the online checkout and resend any items you do not wish to keep. In order to checkout you must visit your account on their website and comment about each piece. If you choose not to keep something write why that piece was undesirable and that helps the stylists find better options in the future. To start off my personal fix description I love how within each box there is always a personal note from my stylist. For this fix she discussed the spring appeal of each piece. She also gave me ideas about how to wear some of the garments. This dress is a lot of fun. The pattern is very bold and lively, and I like the cinch sash which ties on the side to highlight my figure. The fabric is of great quality. However, I ended up passing on this deal for the shear fact that this dress was entirely too expensive for me. I could never pay out triple digits for a sun dress with a clear conscience so this one found itself packed back into the envelope provided by Stitch Fix. That was a hard decision. This piece is comfortable and perfect for layering. I really liked the fit of this top and look forward to wearing this versatile top throughout several seasons. Yes, you read that right and your eyes aren’t playing a trick on you. My Stitch Fix sent me new red TOMS. I’ve mentioned before the importance of including a link to pinterest and social media for your stylist. Mine mentioned a recent blog post of mine about TOMS in an email. These were perfect and exactly what I was looking for. Of course these TOMS made the cut! This jacket brought a little warmth to the photo snapping, however, I already own an extremely similar jacket so I sent this adorable piece back to the factory. This dress is perfection. I love the navy and white stripe design, the light fabric, and the way it fit my figure. It showed off some of my best features and remained cute and modest. Also, this was the most inexpensive bit of the whole box so it was practically a steal. I cannot wait for the temperatures to get warmer so I can get some wear out of this fun dress. I also love that it can be casual or more sophisticated based on shoes and accessories. So, as always I was extremely pleased with my fix. I ended up with three new clothing items which I love and am excited to wear as the weather reflects its true season in the future. Which pieces were your favorite?